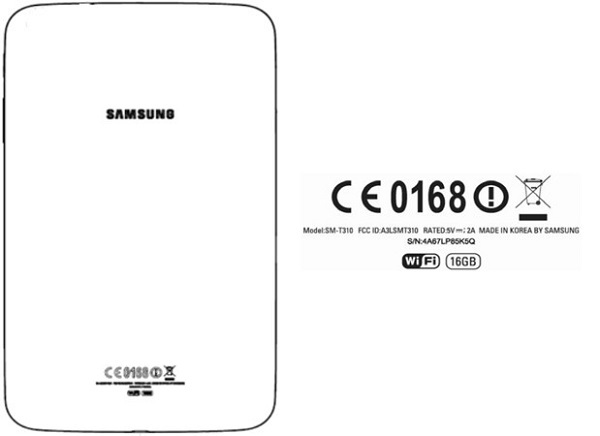 Samsung SM-T310 spotted at FCC, Is it the Galaxy Tab 3 8.0? After the launch of Samsung’s flagship Galaxy S4, everyone is awaiting the 8 inch Galaxy Tab 3 now. Seems like the wait is almost coming to an end, with reports claiming that a similar device visited the FCC. According to reports, a Samsung device with the codename SM-T310 was spotted at the FCC. Considering the Galaxy Tab 3 7.0 was codenamed as the SM-T210, it’s very likely that this device could be the Samsung Galaxy Tab 3 8.0. As per the FCC, the Samsung SM-T310 has a 9 inch diagonal frame which implies an 8 inch display. Also the device is said to have 16 GB of internal storage along with Bluetooth and Wi-Fi connectivity. The device is said to be powered by a quad core processor and have a resolution of at least 1280 x 800 pixels.